Heidelberg's Christmas market extends to over five beautiful and historic market squares: Kornmarkt, Marktplatz, Universitätsplatz, Anatomiegarten and the Bismarckplatz. 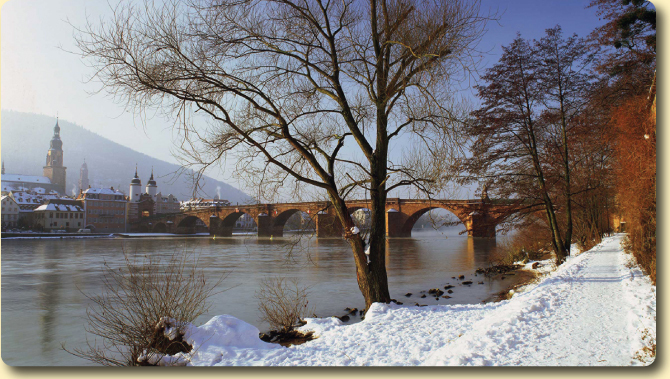 With its 140 or so highly individual stalls spread over five unique locations, Heidelberg’s Christmas Market has become an absolute ‘must’ among connoisseurs of Yuletide festivities. In addition the Heidelberg Craft Palace Christmas Market is also well worth a visit; open on two long weekends in December. The atmosphere here is quite unique – the charming ‘olde worlde’ wooden huts blend enchantingly into the background of historic squares in the Old City, while illuminations add a magical atmosphere to Europe’s longest pedestrian shopping street, the Hauptstrasse. Directly below Heidelberg's Castle, situated on the Karlsplatz, a popular attraction is the “Christmas on Ice”. Surrounded by trees, glistening with hundreds of stars, Christmas on Ice on Karlsplatz enjoys such a delightful setting that it ranks among the loveliest to be found anywhere in Germany. Here Heidelberg's residents and guests can skate round the open-air ice rink to the accompaniment of Christmas music on a real ice surface. Another fascinating experience is the Art-Advent Calendar at the Heidelberg Castle, which has already decorated the Vienna City Hall. From 1st to 24th December, the windows of the English building serve as a multidimensional advent calendar from behind which the works of prominent personalities will appear. 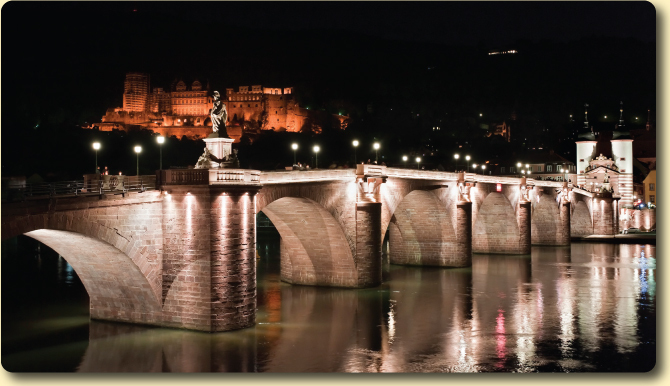 From original works, backlit duplicates are produced and tailor-made to be integrated into the facade of Heidelberg's Castle. On 12 days in December, the Heidelberg palace gardens will host a smaller Christmas market, offering visitors a wonderful selection of original German Christmas ornaments, decorations and gifts, all lovingly handmade by skilled craftsmen. Classical music drifting from the palace chapel, featuring an organ and a trumpet, will enhance the festive atmosphere, adding to the aroma of gingerbread and other tasty treats. Walking through the snowy gardens, costumed tour guides will shed light on how the court once celebrated Christmas. Bismarktplatz is the entrance to the Altstadt, and here the decorated stands are a wonderful way to start an unforgettable Christmas market visit. The Anatomiegarten holds an inviting array of unusual arts & crafts, perfect for a shopping expedition, a mug of mulled wine, bratwurst or fresh-made crepes to help you along the way. 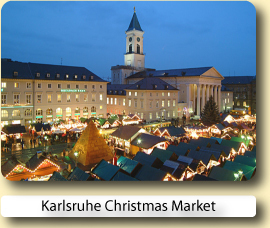 The University square lures one with many gift ideas, such as hand-blown glass ornaments, ceramics, woodcrafts, candles, traditional German Christmas decorations and original Heidelberg photographs. 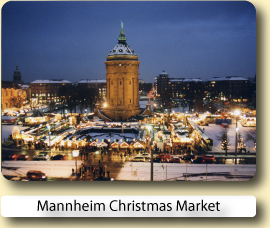 Here you will also find a Christmas carousel, and at the booth “Zum heiteren Christkind” you can enjoy a mug of mulled wine, with the ability to keep the mug as a souvenir. 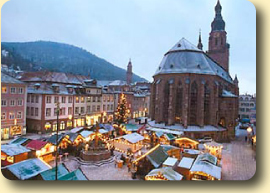 The Heidelberg Market square is where you can find the Heidelberg Christmas pyramid, which revolves with historical figures from Heidelberg’s history. Cinnamon stars and roasted almonds also await visitors, big and small, at the house of Santa Claus. The Corn market is where the well-known Madonna statue compliments the view of the castle. And it is only fitting that the manger, together with a petting area, with donkeys and sheep is also here. 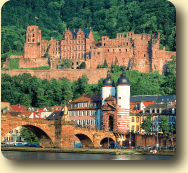 Heidelberg is famous around the world and a favourite among international tourists for its romantic and vibrant atmosphere. picturesque setting on the Neckar river amid the foothills of the Odenwald forest. metres wide, over eight metres in length and has a capacity of precisely 221,726 litres of wine. throw away to the Kornmarkt, for many Heidelberg's prettiest square. you can experience for yourself over a glass of wine in beautiful old student pubs such as Sepp’l and Zum Roten Ochsen. 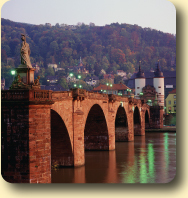 We had a beautiful room overlooking the Neckar River. It was a million dollar view. The room was large and clean. You cannot beat the location of this hotel! It is directly on the Nectar River at the entrance to the Old Bridge, and a block from the old town. The room and bathroom was updated very nicely. Very modern, nice feeling hotel. Good value. Comfortable and spacious rooms. Good service. Good location: close to main train station, river and close enough to the Altstadt. Everything about this hotel is first class - location, staff, view, services - everything. There is not a single negative to report. 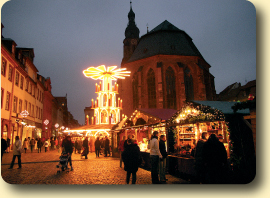 Book your hotel for the Heidelberg Christmas Market with Expedia or Hotels.com.Both online reservation services will let you compare and book hotels at great low prices.